The Cleveland Indians spent much of the first half of the season tinkering with their relief pitching, and after their worst bullpen meltdown of the season, they will go into the final contest of their three-game series with the Cincinnati Reds on Wednesday night having tweaked their bullpen again. [post_ads]Cleveland has placed deposed starter and bullpen long man Josh Tomlin on the 10-day disabled list with a right hamstring strain. To replace Tomlin on the roster, the Indians recalled right-hander Adam Plutko from Triple-A Columbus. Those moves were made before Tuesday's game in which the visiting Reds scored seven runs with two outs in the ninth inning to stun the Indians 7-4. The Indians have lost a season-high four games in a row. Plutko is a starter, but the Indians will temporarily use him in the bullpen in place of Tomlin, whose trip onto the DL comes after he had pitched three days in a row, and not particularly well. In those three games he pitched three innings, giving up five runs on five hits, including a double and two home runs. Tomlin began the season in the starting rotation, but after going 0-3 with an 8.10 ERA in six starts he was moved to the bullpen, where in 17 appearances he is 0-2 with a 5.21 ERA. In the first game of the series against the Reds on Monday night, Tomlin gave up a two-run home run to Scott Schebler in the ninth inning that was the difference in a 7-5 Indians loss. 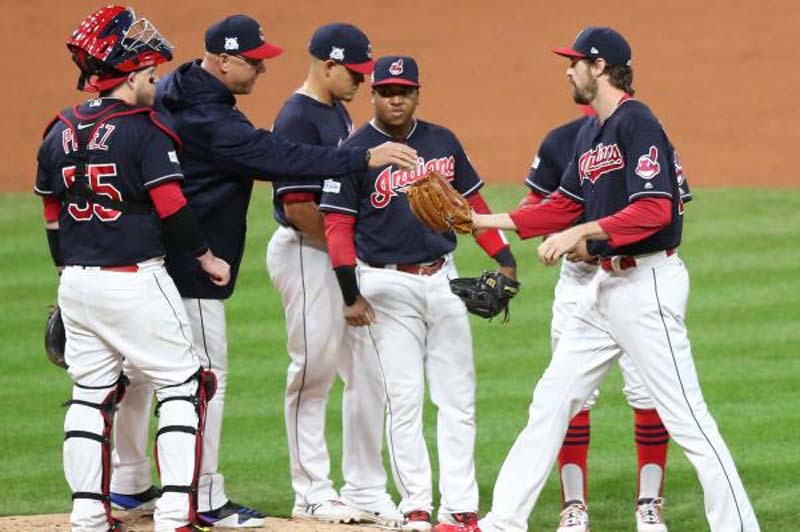 "After the game he owned up to it that his hamstring has been bothering him," Indians manager Terry Francona said. "I appreciate him going out there and pitching but it (the hamstring injury) was getting in the way. He can pitch with it, but not the way he needs to pitch." Home runs have plagued Tomlin throughout his career but especially this year. He has allowed 21 home runs, third-most in the American League, despite the fact that he hasn't started a game since May 15. This will be Plutko's fourth stint with the Indians this year. In seven games (six starts) with Cleveland, he is 4-2 with a 4.66 ERA. In 10 starts with Columbus, Plutko was 5-3 with a 1.94 ERA. Wednesday's pitching matchup will feature a pair of right-handers in Cincinnati's Tyler Mahle and Cleveland's Carlos Carrasco. Mahle (7-6, 3.66 ERA) leads all National League rookie pitchers in wins, games started, innings pitched and strikeouts. His last start came Friday, a 3-2 win over the Cubs in which he pitched 6 2/3 innings, allowing one run on five hits, with four strikeouts and two walks. Mahle hasn't lost since May 20. In eight starts since, he is 4-0 with a 2.62 ERA. He has made three starts in interleague games in his career -- all this year -- and is 3-0 with a 1.45 ERA. Wednesday will be his first career appearance against Cleveland. Carrasco (9-5 4.28) beat Oakland 10-4 in his last start Friday. He pitched 5 1/3 innings, allowing three runs on seven hits, with seven strikeouts and no walks. In two interleague starts this year, Carrasco is 2-0 with a 1.69 ERA. For his career, he has appeared in 18 interleague games and is 7-4 with a 2.97 ERA. In five career appearances (four starts) against the Reds, Carrasco is 2-0 with a 4.45 ERA.